When facing a short corner, it is a good idea to follow the ball from the injection to the shot. By maintaining your focus on the ball throughout the whole process, you are more prepared for making the save, able to watch the ball into your equipment, rather than simply reacting at the last moment, not able to be aware of space to put the rebound and such like. Locating the actual ‘castle’ that will be receiving the ball, and working out the potential shooter/drag flicker is also useful for being able to react to the shot. 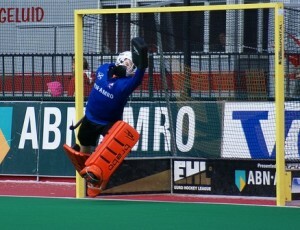 One of the main ways of dealing with the threat of the shot on the penalty corner is to watch the pass from the line through to the actual shot; allowing you to prepare for the save by observing the injection into the D. The goalkeeper stands in their goal, watching the injector release the pass into the D. This way, you learn who will be taking the shot; this is especially important if the opposition changes their routine on the penalty corner (so you can tell where the shot is coming from as you can watch the pass being made to the shooter) and you are not sure who will be taking the shot. When you watch the pass, you need to concentrate on the ball. The focus is on where the ball is; following it from the injector to the shooter. This helps in identifying the shooter, especially if the opposition has changed their penalty corner set-up. Concentrating on the ball from the pass, you can prepare your move out, before reacting to the shot itself, having stepped out of goal and got into a good position. In a way, it helps to ‘psych up’ for the incoming shot on goal; preparing you for the shot, through tracking the ball and maintaining focus on it. Watching the pass gives you the advantage of not committing on a shot if the pass fails. It also gives you the advantage of finding out who the shooter is, if the opposition are using multiple “castles” (where the ball is stopped), or if the shooter changes as the opposition changes their routine (if you are doing too well!). Focusing on the ball as I keep harping on about is just as important when facing a short corner. Some goalkeepers don’t bother watching the ball through and prefer to react purely from what occurs in front of them, but I would like to think that focusing in this way is more beneficial to being able to make the save. Losing track of the ball and not being fully focused means you are not giving yourself the best chance to make the save as you are not fully prepared or rely too much on your reflexes and reaction speeds (which may not be top notch! ), when facing the expected incoming shot or drag flick. By focusing on the ball from the injection, you are ‘locking on’ to the ball, mentally focused and intensely ready for the ball to come towards you. Watching at the injection also helps with commanding your defence of the corner, obviously, as you are aware when the ball has been released, for your defenders to charge out from the goal! A lot of goalkeepers set up this way; standing so that they face the injector, to watch the pass through. Once the injection has been released and the shooter identified, they then move out of goal to face the shot. Most coaches coach the method of watching the injection on the penalty corner; enforcing the need to watch the ball from the pass into the shot. 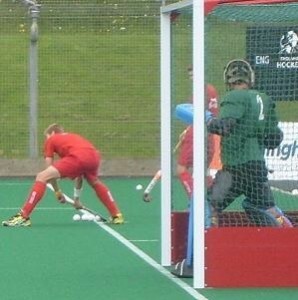 Whilst some goalkeepers stand in the goal in a sideways stance, parallel to the goal post, it is possible just to simply turn your head to watch the ball being released by the injection, following it across to the receiver. The importance of focusing on the ball from the injection and watching it to see who receives it, is incredibly important when dealing when faced with a short corner making use of various options to try and confuse the goalkeeper. With well drilled routines and the quality of shooters, at high levels, it is important to be aware of how you need to respond to their crafty ways! 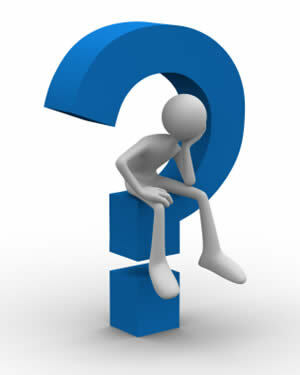 If you misjudge and get fooled by the dummy, then you’re not going to have much chance of making the save. Anticipation and reading the situation gives you an advantage as always, giving you that extra edge (even if slight), to react properly. By watching where the ball ends up, you are in a better position (metaphorically!) to make the save. 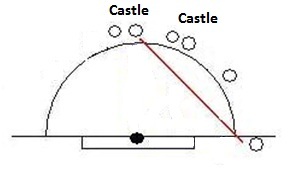 A ‘castle’ as it is known is the set-up for stopping the ball and then flicking or shooting at goal. The stopper of you will and the potential shooter/drag flicker. In this case, a well crafted routine will often use one or more potential shooters and stoppers as well, setting up multiple ‘castles’ to try and distract you, confusing the goalkeeper as to which way to go and who will be receiving the ball and creating a scoring opportunity from it. It is therefore crucial that you follow the ball to work out which is the ‘castle’ that is going to create the opportunity on goal. The following clip is a very well thought out corner routine, but shows the example of multiple castles! Dummies can also be incorporated into a routine, which means the goalkeeper has to be more aware and conscious of working out the actual shooter. The dummy can vary, but generally involve another ‘shooter’ will pretend to shoot on goal, hoping to put the goalkeeper off and confuse them into going the wrong way. 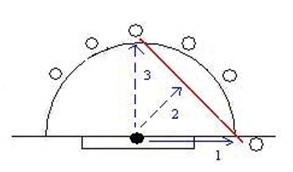 The receiver of the ball may slip the ball to another player to drag flick, or pass the ball into the D for someone to get onto and shoot. These are the types of routines you can see in the Euro Hockey League, but could also be utilised at other levels. Whilst both teams prepare for the corner, you will have time to look at the opposition and try and deduce who will be going to shoot at you. The more aware you are and the ability to follow the outlet pass to the actual shooter is incredibly useful. By watching the team set up their players in front of you, you can prepare yourself more readily. Noticing where the ‘castles’ are being set up, conscious of angles etc. and ‘pre-scanning’ the top of the D to locate shooters or runners in for deflections, helping you mentally address the scoring threats and organise your defence accordingly and prepare and anticipate for the save. Ultimately, it is good to focus on the ball and also to ‘read’ the game in front of you, especially against a short corner. By being wary of the opposition’s routines, you are more likely to make the save. Being aware of things like this in a game situation will improve your save percentage and ability to make the stop.